Meet the voice of The Walking Stick characters, Kyle Tait. Kyle Tait is a full-time, SAG-AFTRA voice actor and narrator in Atlanta, GA. His first brush with a microphone came in sports radio, calling baseball in the Atlanta Braves’ organization. 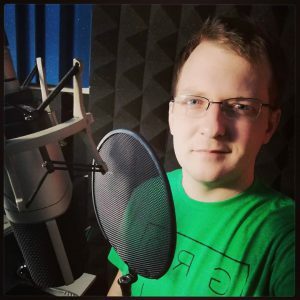 To pass the time in the offseason, he started voicing audiobooks, and a few years later he went into voice over full-time. Now his voice can be heard on more than 35 audiobooks, for major publishers such as Tantor, Gildan, and HighBridge, and countless TV and radio commercials, corporate training videos, and e-learning modules. 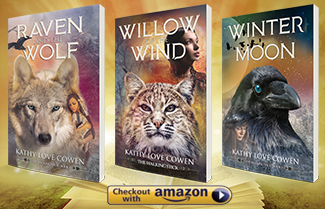 In the Walking Stick series and in Kathy’s life, animals play an important role. 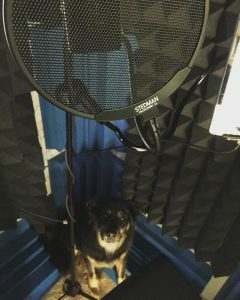 Could Kyle’s studio dog be the voice of Wolf? Visit Kyle’s web site for more information about this talented voice actor. Click the cover to listen to the Audible sample. 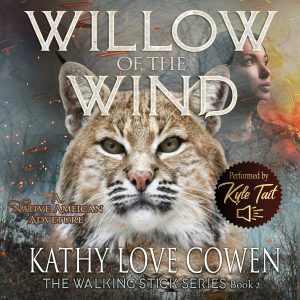 Willow of the Wind is available now on iTunes, Audible, and Amazon. Wolf and Raven soon to be released!